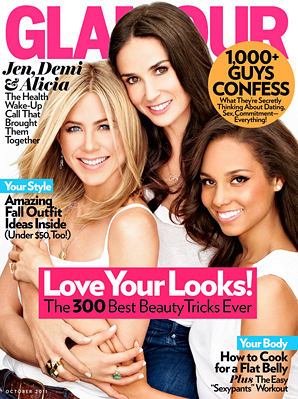 Jennifer Aniston, Demi Moore, and Alicia Keys are the gorgeous trio covering the new issue of Glamour Magazine. The ladies teamed up to spread the awareness on breast cancer. We all know just how prevalent this disease has become, so seeing these A-list stars reaching out to help make a difference in the fight is inspiring. The girls are promoting Five, which is a series of films centered on women and the breast cancer battle. The series will air on Lifetime on October 10th during a two-hour special. KRISTIN HAHN: Take us through how Five came to be. PATTY JENKINS: Why did you want to direct your piece in Five? DEMI MOORE: I’ve known people affected by breast cancer, and since I finished the project, someone in our family has also been diagnosed. But I think that so often there is that “out of sight, out of mind” feeling, like breast cancer is happening to other people, not you. Before this project came up, even I really didn’t want to pay attention. I feel that this came to me to make me pay attention. What I’ve learned from all the work Ashton and I do is that we so often don’t address any cause with enough urgency. PENELOPE SPHEERIS: How did you get involved with Five? ALICIA KEYS: Kristin [Hahn] and Jen called me up; after I read the scripts, I felt like this was something important, and I wanted to be a part of it. I chose Lili because she’s close to my age and I understood the family dynamic. I had an immediate idea of what I could bring to it. PENELOPE SPHEERIS: Have you had any personal experiences with breast cancer? ALICIA KEYS: Yes, people very close to me in my family have had it, and it’s scary and it’s hard. You can read the entire set of interviews in Glamour… go grab a copy today, then make sure to watch, Five!